How do I Make Colored Popcorn? After popping, food coloring or flavored gelatin can be added as a treat. 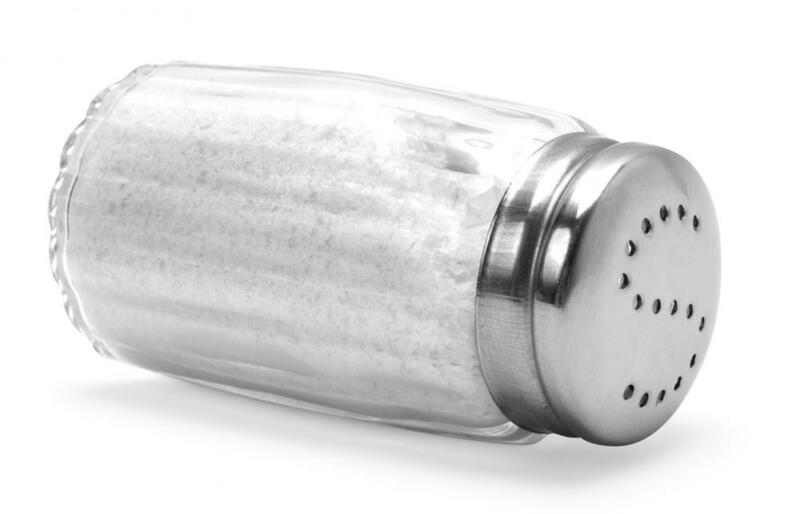 Salt, which is often used to top popcorn. Colored popcorn is a sweet treat that can be made in a variety of ways. The easiest, and most common, method of preparation involves the use of food coloring, sugar, and butter. More complex versions of colored popcorn can also be created using flavored gelatin and corn syrup. For a quick and easy batch of colored popcorn, combine one cup (240 ml) granulated sugar and ¾ cup (175 ml) water in a small saucepan. Heat until the mixture is boiling, and sugar has dissolved. Add 3-5 drops food coloring of your choice, and stir for several seconds. Pour the colored sugar mixture over a bowl of microwave or air popped popcorn, and stir constantly until the kernels begin to separate. To make colored popcorn with gelatin, the process is more involved, but will result in a gourmet style treat. First, pop four cups (950 ml) popcorn on the stove top, in the microwave, or in a popcorn maker, place in a large mixing bowl, and set aside. Line a large cookie sheet with aluminum foil or wax paper, and preheat the oven to 300 degrees F (150 degrees C). Next, combine ¼ cup (60 ml) butter or margarine, and three tablespoons (45 ml) light corn syrup in a small sauce pan. Heat on low until the butter has completely melted, then add ½ cup (120 ml) granulated sugar and one 4-serving size package of flavored gelatin. Continue to stir until the gelatin has dissolved completely, then turn the heat up to medium and bring to a boil. Reduce heat to low, and simmer the mixture for an additional five minutes. Pour the gelatin and sugar mixture over the popcorn and toss, ensuring that all the kernels are coated thoroughly. Spread the colored popcorn onto the lined cookie sheet, and use a fork or other utensil to spread evenly. Bake the popcorn in the preheated oven for ten minutes, and then allow it to cool completely. Remove from the pan and break into small pieces. Store any leftovers in the refrigerator, if necessary. Combine peanuts or miniature marshmallows with the popcorn before adding the gelatin mixture, for added flavor and texture. For a low fat version of colored popcorn, leave out the sugar, and use sugar-free gelatin. Brown sugar may also be used in place of granulated sugar, if desired, or you may use half brown sugar and half granulated sugar. How Do I Choose the Best Popcorn Oil? How Do I Choose the Best Natural Popcorn? What Are the Best Tips for Making Skillet Popcorn? What Are the Different Types of Popcorn Equipment? How Do I Choose the Best Popcorn Toppings? Is there any difference between using marshmallow and this recipe, if both are proceed in the baking oven for five minutes after being coated? @ChickenLover - I have seen the kernels but you are right that most of them end up popping into white popcorn puffs. So it is pretty much useless if you are looking for candied popcorn or just looking to turn your popcorn colors. I'm sure there is a way to mix together food coloring and regular salt, however I'm not sure if you would have to use a large amount of salt to actually turn the popcorn colors as I've never tried it. Also, you would have to spread the salt out to let it dry after coloring it. @WalrusTusk - Have you ever heard of colored popcorn kernels? In most cases, they all pop up white, but supposedly taste better than "regular" popcorn. It is also fairly expensive from what I know, but might be more of a novelty product than anything else since they don't pop up in colors. I wonder if Orville popcorn comes in colors? @abiane - Gourmet popcorn often has the option of colors as well. While you might find recipes all over the internet it might be faster to just go with tinted spices like you first stated. @anon64203 - Thanks for the tips! There are several different types of popcorn seasoning that can change the popcorn colors as well and you don't have to bother with all that mixing a such. Even things like cayenne pepper and chili powder will turn the popcorn red. You can find most of these recipes on the internet, many of which are tried and true and will have more desirable results than the recipe above. However, cooking is always trial and error and in most cases you won't ever find a recipe that has a unanimous adoration with it. That is to say all recipes will be tweaked to suit personal needs and tastes. Horrible recipe! Makes soggy popcorn! Try using way less water and add some corn syrup. That's what worked for me!